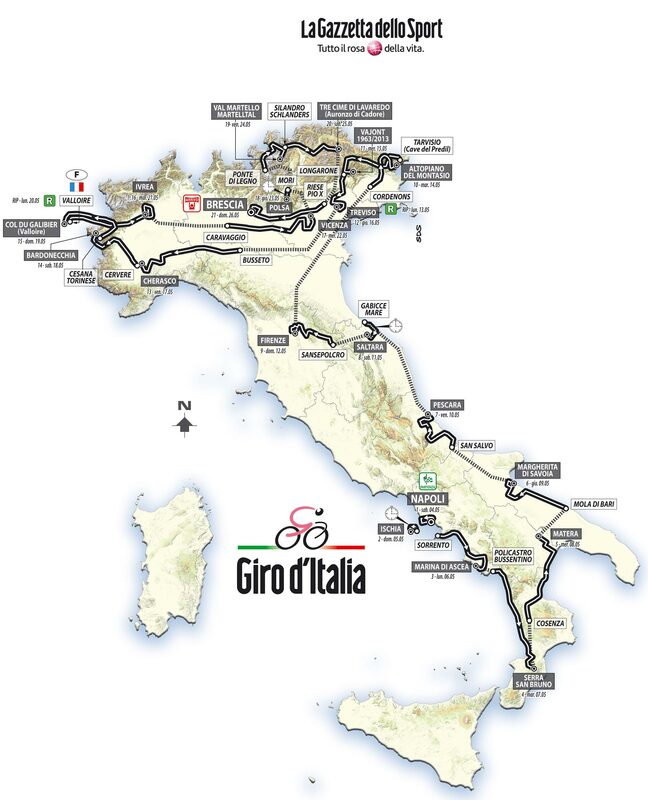 Organiser RCS Sport officially unveiled the 2013 Giro d’Italia today in Milan, a route that starts in Naples, takes in Galibier and returns to Tre Cime. It includes a long time trial, which should please Tour de France champion, Bradley Wiggins (Sky). Race director, Michele Acquarone told Cycling Weekly, “We’re trying to bring in all the top riders, create a route that rivals the Tour. In his second year as director, Acquarone seems to be up to full speed and the effect is greater without the burden of starting so far north. Last year, the Giro charted new territory, going further north than any Grand Tour before, by starting in Herning, Denmark. Because of those three days and an early rest day transfer, there was less time for what makes the Giro so great: Italy. This year, besides the foray into France for Galibier, the route is completely Made in Italy. Acquarone and operations director, Mauro Vegni originally were thinking about taking the race further afield to visit the Alp d’Huez. They settled on the Galibier, for the first time in race history, finishing on the north face. It is just as high at 2,645 metres and they say harder than the south side, where Andy Schleck rode to victory in last year’s Tour de France. The Galibier follows the Jafferau stage the day before and joins together to kick off the final mountainous week. Travelling back east for the finish in Brescia, the race features a mountain time trial and a stage to Tre Cime di Lavaredo. Tre Cime, covering the Giau and San Pellegrino climbs beforehand is back after six years. Acquarone will hope to touch on the golden moments that his former director, Vincenzo Torrani enjoyed in the 1960s and 1970s, not those that we saw in 2007 when Riccardo Riccò won on his way to disgracing the Tour a year later. Torrani introduced the climb to cycling in 1967, a year ruined by snow and over-aggressive fans. The following year, Eddy Merckx stomped the competition, took the pink jersey for good on the way to wining his first Grand Tour. In 1974, the climb marked Merckx’s worst day. 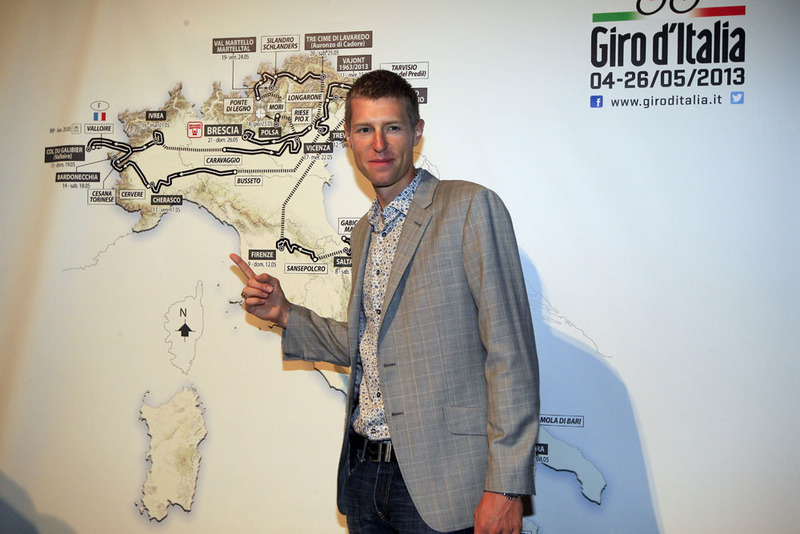 He saved himself and the jersey, but only just, winning his last Giro by a slim 12 seconds. The Tre Cime takes the place of the Passo Stelvio next year. This year, the Stelvio hosted the final mountainous act on the penultimate day, when Thomas De Gendt (Vacansoleil-DCM) rode clear for a stage win and third overall, and Ryder Hesjedal (Garmin-Sharp) positioned himself for the overall win. The following day, Hesjedal tore through the streets of Milan on his TT bike to take the overall lead and pink jersey from Joaquím Rodríguez (Katusha). The battle next year likely will be decisive as the following day, Riese Pio X to Brescia, is a road stage. Mark Cavendish, regardless if he is racing for Sky or Omega Pharma, will be happy with the Grand Départ in Naples. Organisers shifted the proposed team time trial to the following day, on the island of Ischia. The move allows for Cavendish and other sprinters to sprint into the race lead on day one. Wiggins also will be happy. 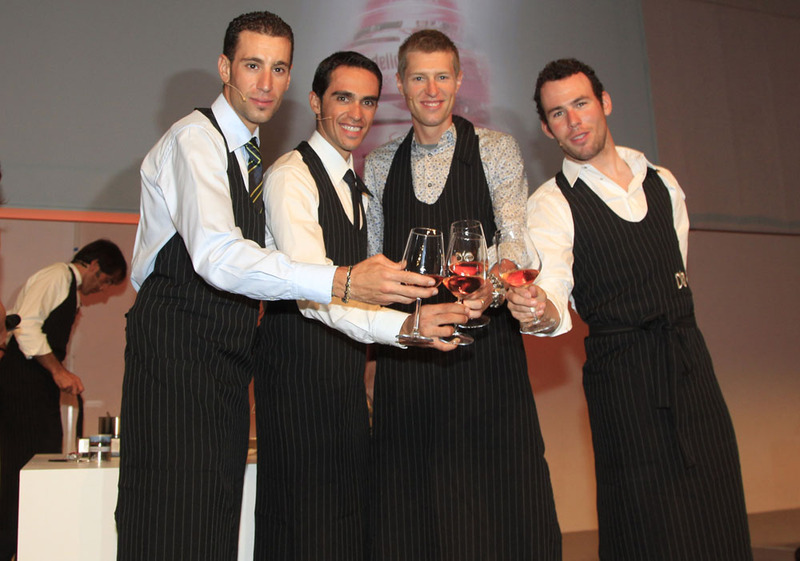 After the team time trial, and skirting around the boot, the Giro features a long individual test. The 55.5-kilometre leg from Gabicce a Mare to Saltara should sway the reigning Tour champion to the Giro, a first since the 2010 edition when he won the opening time trial in Amsterdam. Wiggins would need to hold on over a demanding final two weeks. Following the Saltara TT, the race travels into Florence on the 2013 Worlds circuit and then transfers north towards the Alps. Besides the Galibier and Tre Cime, the Giro features a 19.4km mountain TT to Polsa and mountain romp to Val Martello the next day. The 19th leg climbs the Gavia pass from Ponte di Legno, the Stelvio from Bormio and drops down into the Martello Valley for a final 22.3km kick to the line. The run will leave little left in the tank for Tre Cime and a party around Brecia’s castle. Wiggins to target Giro and Vuelta in 2013?